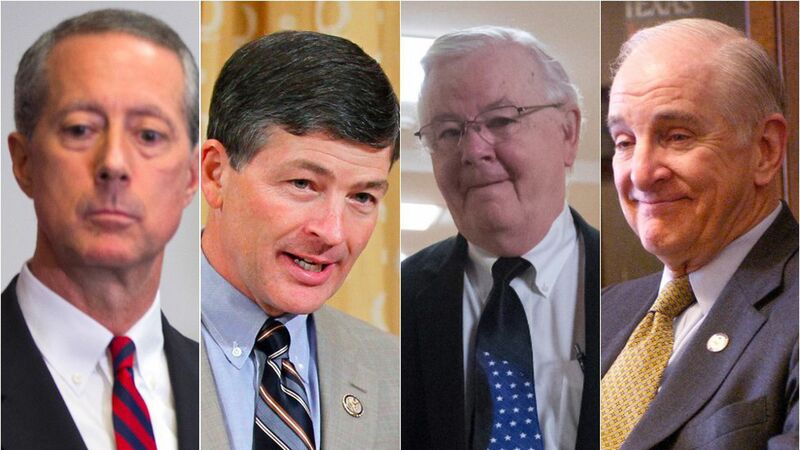 From left to right: Rep. Mac Thornberry (Photo: Evan Vucci/AP), Rep. Jen Hensarling (Photo: J. Scott Applewhite/AP), Rep. Joe Barton (Photo: J. Scott Applewhite/AP), and Rep. Sam Johnson (Photo: Evan Vucci/AP). Four Texas Republicans voted against the House bill providing $15 billion in relief funding to southeast Texas in the wake of Hurricane Harvey, according to the Texas Tribune. Texan Congress members presented "a united front on Harvey aid," but after the debt ceiling deal Trump cut with Rep. Pelosi and Sen. Schumer was added to the bill, Republicans weren't pleased. The bill: The $15 billion in funding was a part of "a larger deal to avoid a government default and shutdown for the next three months," which caused hesitation among members. The no-vote Republicans: Joe Barton of Ennis, Jeb Hensarling of Dallas, Sam Johnson of Richardson, and Mac Thornberry of Clarendon voted no. All four represent counties not impacted by Harvey. Rep. Barton said while he isn't against relief packages, he is "against raising the public debt ceiling without a plan to reduce deficits."